Dr. Enell Hall, former Vice President and Ministerial Secretary of West Indies Union Conference (WIU) now Jamaica Union Conference (JAMU), passed away in Orlando, Florida on March 26, 2019 after a protracted illness. He was 80. 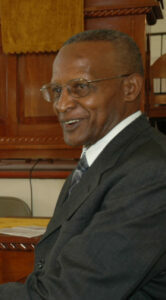 His career in ministry started in Central Jamaica Conference in 1971 when he served as Ministerial Intern. Three months later he was assigned as Publishing Assistant and within six months he was appointed Pastoral Evangelist for the next six and a half years. Dr. Hall migrated to the United States of America on study leave in 1978. He returned to Jamaica in August 2003 to serve as Assistant Professor in the School of Religion and Theology at Northern Caribbean University (NCU). In September of 2005, Dr. Hall accepted a call to serve as Ministerial Secretary of WIU, and in November 2005, at the WIU Session, Dr. Hall was asked to serve in the capacity of Vice President and Ministerial Secretary. He served in those capacities until November 2010. He then joined the faculty of NCU in January 2011, where he served as Assistant Professor in the School of Religion and Theology until his retirement in August of the same year. 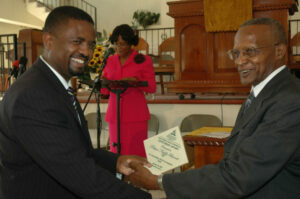 Dr. Enell Hall presents a Centurion Award to Pastor Nevail Barrett of the Central Jamaica Conference for Outstanding Work in Evangelism for 2006 at a Pan Jam Pastors meeting at the Mandeville Church on January 24, 2007. In the background is Mrs. Patricia Allen. “The Ministerial Department of Jamaica Union Conference along with all our pastoral families salute him for the difference he has made in our lives,” Smith said. Dr. Hall is survived by wife Rita, a former worker of WIU; sons Marc and Marvin; daughters Monique and Michelle; Sister Lecent; Brothers Melville, Robert and Sherwin; a host of nieces, nephews and other relatives and friends. “We want to assure his wife Rita and the rest of the family of our constant prayers on their behalf as the family mourn their loss,” Brown added. The Funeral Service for Dr. Hall will take place on Friday, April 12, 2019, at the Forrest Lake Seventh-day Adventist Church, 515 Harley Lester Lane; Apopka, FL 32703. His body will be interred at the Highland Memorial Gardens; 3329 E Semoran Blvd., Apopka, FL. 32703.